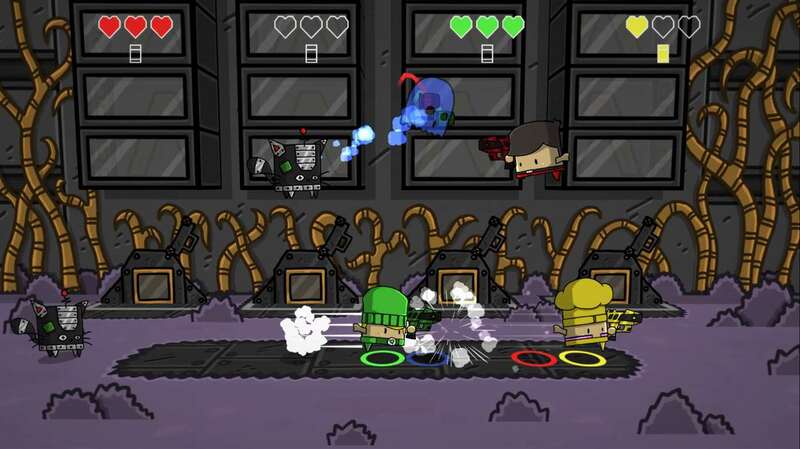 The indie gaming scene is full of local cooperative party games. Inexpensively priced, and delivering fun and games for all the family to enjoy, the vast majority of these one hit wonders hold enough content, and just enough draw, to drag together a bunch of like minded friends and family members for a fight over bragging rights – at least until the next cheap game arrives to grab their attention. 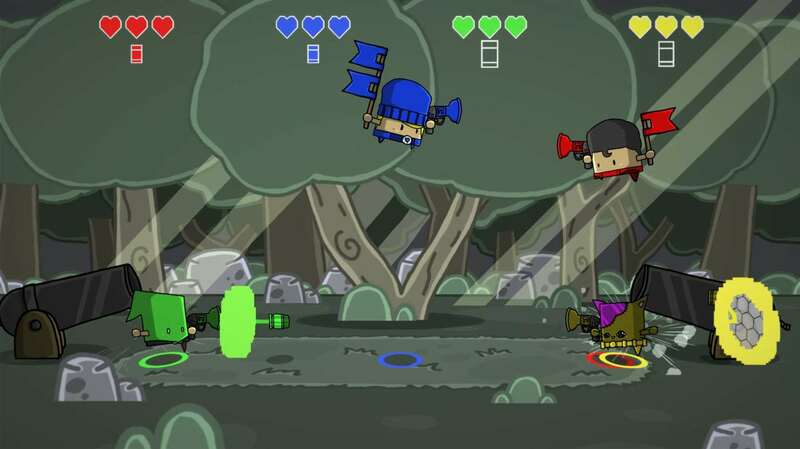 A frantic nature, plenty of over the top gameplay and enough reason for shouting and screaming to ensue, are normally the staples for any such game. And on the face of it Guilt Battle Arena delivers all those qualities. But in order to stand out from the crowd, you need a decent USP, something that will see you fully distinguished from the pack, something to allow those friends to want to meet up more than just the once. The selling point for Guilt Battle Arena? You’ve got one gun, and one bullet. You best get learning how to use it wisely. 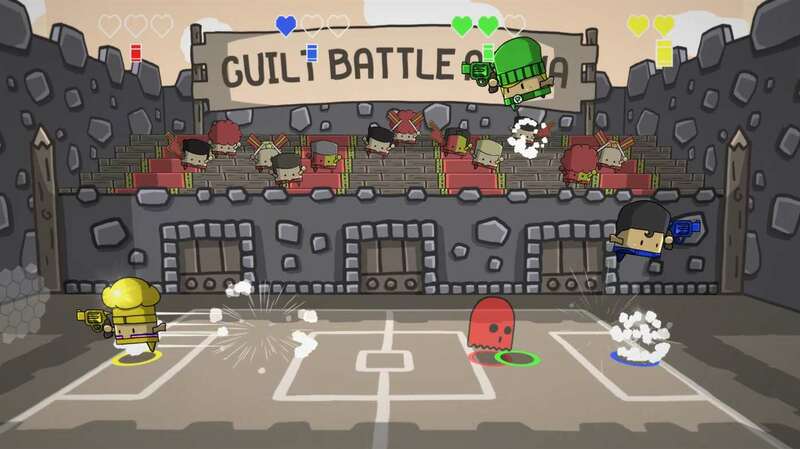 A game that is full of couch based multiplayer battles and cooperative combat, Guilt Battle Arena sees you playing as one of the numerous GUILT Patrol, as they fight back against the Dreadful Judge and his army of evil doers. The aim? Take down as many of them as possible until the Judge finally succumbs and understands the errors of his way. Easy eh? Well yes, the basics are actually. The entirety of the game sees you and your friends placed in a small arena in which you can move left and right, jump, double jump and dive. And you’ll need to utilise all of these movements as the second you’ve fired your revolver at the enemy, you’ll need to run over and grab that same bullet, before firing it off towards another baddie. The whole premise is a simple one, and thanks to a decent little tutorial, it doesn’t take more then two minutes to understand the strategy required. 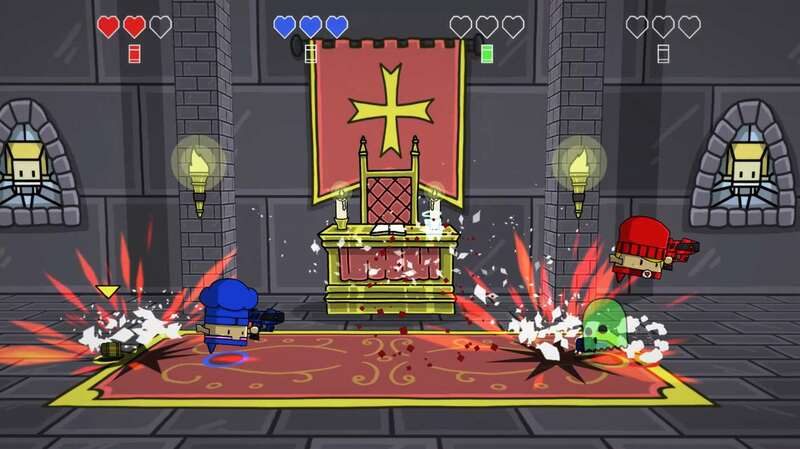 With enemies coming in from left and right, high and low, you’ll need to shoot and rebound this bullet as quickly as possible, in order to take down anything that moves. In the first instance, this would be your poor friends and family as the Versus mode plays host to all manner of crazy game modes. With seven in place, and the option to play through things in single matches, or longer affairs which take up to 10 wins for someone to be crowned the GUILT Patrol champion, the variety is fairly decent; if a bit samey. Your standard Last Man Standing does what it says on the tin, whilst Hot Potato Bomb and Capture the Flag are also both pretty self explanatory. Things do get a bit silly, a bit quickly though – this is a fun party game after all – and Chicken Rain sees numerous chickens come falling from the sky, attempting to kill anyone they hit. The crazily titled Cat Mania does pretty much the same thing, just with bouncing cats. Rocket Man introduces a homing missile into the equation, with it always homing in on the targeted player at any one time. Get shot, and that player becomes the rocket’s target… until at least you pass the buck back the other way. Finally we see the Predator mode which sees only the Predator able to dish out any damage, with all other players needing to shoot him to become the Predator themselves and take the fight to the wire. Each game mode sees anything between 2-4 players take part, and as you can imagine, the more players you have in place, the more hectic it gets. But alongside the multiple game modes come another six sets of modifiers – Ghost, Multi-bullets, Jetpack, Trampoline, Invisible and the game quickening, Speed Up. Once more, these all do what you would expect allowing players to go invisible, become ghosts, fire off multiple bullets depending on their rank in game, fly with a jetpack, or bounce like they are on a trampoline. It must be said that the Versus mode is fairly good fun, but only for a few minutes at a time – and preferably with the modifiers switched off. See, whilst it’s nice to have the option, in reality these just turn the entire game into a bit of a mess, taking away the fun that it is meant to convey. Without them on, and as a party title that can be used as something to fill a space in proceedings, then it just about does the job intended of it, but I’d be very surprised if you were still bothering to play through things with mates a few days after your initial outlay. Thankfully, a co-op mode caters for those who prefer to work together instead of killing each other. Even more thankfully is that this is available to 1-2 players. So solo gamers do have a bit of a reason to take a little look at Guilt Battle Arena. Strangely, it is this co-op mode that has become the big draw. If you ignore the Target Practice tutorial stage, the other seven stages see you pitting yourself up against the very best of the Dreadful Judge’s forces, with your sole task being to take down as many as possible, earning stars in the process. With the rockets, chickens and cats all thrown in from the Versus mode, it’s rather addictive to jump in for two minutes and try to best your own scores, and those of your mates, placing higher on the worldwide leaderboards each time. With the action getting faster by the wave, melee and ranged enemies appearing, and your one bullet skills needing to be on point, it is here where Guilt Bullet Arena begins to show some exciting times – if only because the lure of getting a personal best on each stage is too big to ignore. Again though, it gets very samey, very quickly, and for all the love in the world, there is only so much one bullet shooting one person can take before it becomes old hat. The promise of Gamerscore popping should you manage to kill off enough enemies in each stage to warrant a 3 star rating is a welcome one, but you really will need to pull out all the stops in order to see you scoring anywhere near what is required for the ping of an Achievement or two. And that is disappointing to say the least. Even the promise of unlockable skins for your rather delightful characters isn’t going to be enough to see you still playing Guilt Battle Arena a week or two down the line. For all the bright colours and smooth gameplay mechanics that the team at Invicible Cat have brought, it really does feel like it is lacking in any real purpose. The price also goes against it – in quite a big way actually – as any quick shooting party title needs to be tempting enough for a group of mates to chuck a quid or two into a pot, in order for a purchase to be made. The £12 odd that Guilt Battle Arena asks for is too high to see a purchase on a whim, or tempting enough for a single player to give the co-op option a shot; especially for the amount of time you’ll finally end up playing it. By all means check it out if you can grab it in a sale and have some mates over for a night of fun and games, but otherwise Guilt Bullet Arena misses the mark. Even with that one deadly bullet it plays on.